The financial crisis has dramatically gathered momentum in the last few weeks. What was a creeping crisis suddenly escalated when a wave of bank bankruptcies spread throughout Continental Europe, resulting in governments reacting by implementing wide-ranging bailout plans. The banks that are the most exposed to risky structured products were caught between the devil and the blue sea, i.e. between the increase in losses and write-downs and the revival of stresses in the interbank market. Indeed, bank liquidity now seems to have clearly overtaken solvency among the grounds for concern. With the notable exception of Lehman Brothers, bailing out banks suffering from a shortfall in liquidity was the motive that led to the intervention of central banks or governments, as well as emergency acquisitions. The bankruptcy of Lehman Brothers, on 15 September, resulted in a real collective realisation of the scale of the threat that led to the G7 recommendations, followed by those of the Eurogroup, which were subsequently implemented according to national rescue plans. 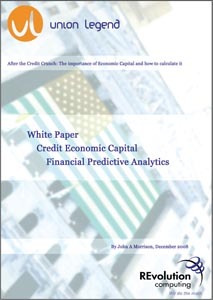 Looking forward to late 2009, trends in economic fundamentals hardly call for optimism... DOWNLOAD the White Paper here! John A Morrison is a Solution Architect in Risk Management. He is Director, Solution Partnerships of Asymptotix and an advisor to REvolution Computing. He has just finished an important White Paper that is downloadable on our website. Intel Software College Architect Clay Breshears stars in a new training material at the Intel Software Network that covers basic content any professor should teach when introducing parlallel programming. While not designed specifically for engineers, this content should also be of use for anyone seeking to understand the basicis of parallel programming on multi-core machines. You can watch Clay teach these modules here. Intel Software College course architects are developing course modules designed to be used at the university level to help teach programming models, techniques and tools. We are excited by this material and think that it would be valuable to software developers as well. We will start making a number of these modules available today and roll more out in the future. Please let us know what you think of the modules; your feedback is key to continuing this program. Radical plans to reboot Europe’s bank lending market are being studied by the European Central Bank, a senior policymaker revealed on Monday after warning that financial market tensions could wreak significant further economic damage. Ideas for a “clearing house” to boost the interbank lending market, which is at the heart of the financial system, were “potentially applicable”, said Lucas Papademos, vice-president of the European Central Bank. An ECB-organised clearing house would guarantee lending, with the intention of overcoming mutual distrust between banks. The ECB has cut official eurozone borrowing costs by 175 basis points since early October but is frustrated that market interest rates remain high. This article covers a period of exceptional instability in the global financial system. The financial market turmoil intensified in September and October 2008, especially following the failure of Lehman Brothers. Subsequently, a number of other financial firms failed, were rescued by government intervention or merged with other financial institutions. As a result, trading conditions in many markets became very strained. Market liquidity deteriorated as market makers widened spreads between prices at which they were prepared to buy and sell. This contributed to numerous apparent anomalies in market pricing. IT IS clear from the share price of Anglo Irish Bank that no one - apart from its board, presumably - believes management when they say they the bad debts in its €73 billion loan book will amount to a manageable €879 million. THE GOVERNMENT commitment to participate in a €10 billion fund to recapitalise the Irish banking system heralds the beginning of the endgame in a process that will still be fraught with difficulty. Nicolas Sarkozy, the President of the French Republic, presided over the European Council held in Brussels on 11 and 12 December. A historic agreement was reached on climate protection and reducing carbon dioxide emissions. The Council also reached an agreement on the European economic recovery plan, the Lisbon Treaty and the European Security and Defence Policy. The European Council approved a European economic recovery plan, equivalent to 1.5% of the GDP of the European Union (approximately 200 billion euros). This plan constitutes the common framework for efforts undertaken by the Member States and the European Union to ensure that these efforts are consistent with one another, thereby maximising their effects. European Commission President José Manuel Barroso believes it is possible to give Ireland legally binding assurances over voter concerns such as abortion and neutrality. Speaking to RTÉ News, Mr Barroso said the topic would be discussed by the heads of government at the EU Council meeting in Brussels. 10 Dec-08: Lessons of the financial meltdown: What new rules and architecture? Friends of Europe in partnership with the Financial Times and with the support of APCO Worldwide will today address the issues of the financial crisis in this Café Crossfire debate. It will take place on Wednesday, 10 December at the Bibliothèque Solvay and will start at 12.30. The massive bail-out arrangements agreed by governments of the world’s leading economies may have arrested the free-fall of financial markets and the failure of more banks, but they raise a host of difficult questions. What should be the future shape and scope of financial services, and how should we redefine the relationship between states and private sectors? What prudential rules and conditions can bail-out governments impose without limiting economic recovery, and what mechanisms will be needed to ensure their closer international cooperation? Featuring amongst others: Joaquín Almunia, EU Commissioner for Economic and Monetary Affairs, Axel Miller, former CEO of Dexia, John Monks, General Secretary, European Trade Union Confederation (ETUC), Poul Nyrup Rasmussen MEP, President, Party of European Socialists (PES), André Sapir, Professor of Economics, European Centre for Advanced Research in Economics and Statistics (ECARES), Université Libre de Bruxelles (ULB). Moderated by Giles Merritt, Secretary General of Friends of Europe and Wolfgang Munchau, Columnist and Associate Editor, Financial Times. REvolution Computing and the Department of Statistics at Columbia University presented on the 4th of December an informative workshop about using statistical computing with R in finance. The conference brought together both academics and practitioners, and was open to public. Ninety-six percent of Lloyds shareholders approved the deal at an annual general meeting in Glasgow on the 19 November 2008. HBOS shareholders will vote on the tie-up on 12 December. Independent Thinker but member of the Asymptotix EcoSystem Robert McDowell casts some shadows over the expected merger between Lloyds TSB and HBOS. His basic question is: Is this takeover at fair value & a basis for restoring shareholder value? Read his independent White Paper here. Barclays’ move to rebuild a European cash equities business, complete with research analysts, sales people and traders, highlights the attraction of relatively simple businesses after the bursting of a bubble in complex investments that were hard to value and, latterly, impossible to sell. The move is a reversal for BarCap, which sold off most of its BZW stockbroking and investment banking unit in Europe in 1997 in order to concentrate on selling high-end tailored equity products and handling highly automated bulk trading. In an interview with the Financial Times, Hector Sants, chief executive of the Financial Services Authority, said supervisors would need to develop a far better understanding of the institutions they oversaw. Banks will face more “intrusive” oversight from the City watchdog as part of its plans to beef up its role and its staff. The December Ecofin Council meeting was devoted to responding to the economic slowdown, preparing the European Council meeting, strengthening financial stability and addressing various tax issues. ECOFIN Council agreement on four key directives for financial stability: the strengthening of bank deposit guarantee systems; the increase of banking capital requirements; the overhaul of the regulatory framework of UCITS (Undertakings for Collective Investment in Transferable Securities); the continuing integration of insurance activities. With this agreement, the French Presidency has met its ambitious legislative targets designed to bolster the solidity and stability of the European financial system.